Are you looking for a high quality, low impact cardio workout that is easy on your joints? Elliptical machines bring the gym to your home and provide a full body workout. 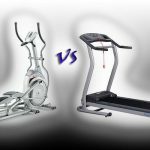 Go directly to the comparison chart showing the stride lengths, max weight limits and the price range and find out the best elliptical trainers for home use. 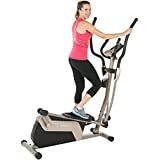 Elliptical and stepper exercise machines give you a good cardio workout while reducing the stress to your joints caused by traditional impact producing exercise. 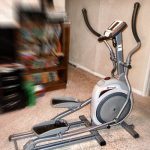 2 What is an Elliptical Machine? Elliptical exercise machines use a fluid, elliptical motion driven by your lower body. Most machines are dual action, with a set of handlebars attached to the pedals. This gives you a great upper body workout at the same time as good cardiovascular exercise. Elliptical trainers use resistance to vary the effort required to move the pedals and handlebars. You can manually set the resistance to achieve your desired level of intensity or use a pre programmed workout to vary the resistance automatically. 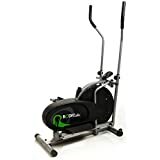 The Stamina In-Motion Compact Elliptical Trainer can be used to get a great low impact cardio and strength workout without the complications of going to the gym. This workout is simple, safe, effective and it fits easily into your daily routine. The In-Motion Compact Elliptical Trainer is lightweight, so you can use it anywhere in your home and at the office. It is small enough to store in a closet and it gives you great cardiovascular workout getting your heart and lungs pumping, so you can burn a lot of calories in a short period of time. It will tone your legs, thighs, bums and trim your waist. You can use resistance tubes for upper body workout. 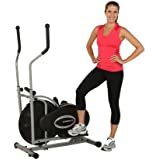 This Compact and portable Elliptical Trainer has an electronic monitor that tracks the strides, distance, exercise time and calories burned. The tension control knob lets you choose your workout intensity or how much pedaling resistance you have. Just turn the knob to the right for more tension and to the left for less tension. The foot pedals can be worked in forward or reverse direction to target your lower body in different ways. When you get on your In-motion Compact Elliptical Trainer, be sure you have a chair back, sofa or wall to help you establish the balance when you step on to the elliptical. You can use this machine while sitting down and it is as effective. Users have complained about breakage after prolonged usage in standing mode. The unit does not run on electricity. No external power source is required. Very easy to assemble and most users assembled it in 5 to 10 minutes. 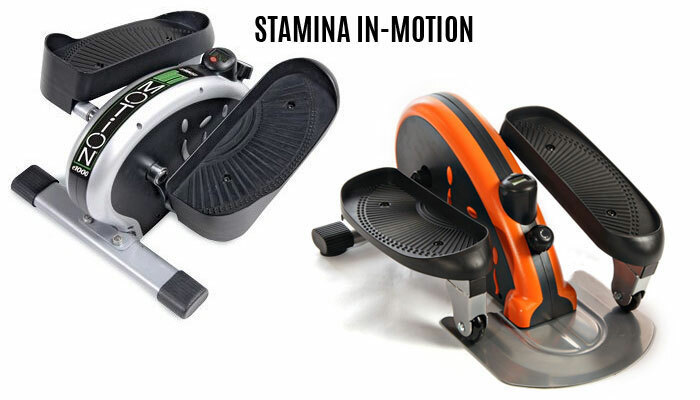 The motion is more like mini peddling or a stair climber. The length of the step/stride is shorter than a full sized elliptical machine. The weight limit is around 250 pounds. Some users have problems balancing without arm support. Works well on carpeted or wooden flooring. It uses a replaceable button type battery (LR44) for display. To peddle under your desk make sure you have at least 27 inches of clearance from the floor to the bottom of your desk. The upper body resistance bands are not included in the package. You may use wristband activity trackers or pedometers to record the number of steps you take, while working out on Stamina In-Motion Compact Elliptical Trainer. Users have successfully used it with Fitbit and Garmin fitness trackers. Make sure you take steps in standing position and swing your arms while working. 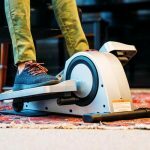 This mini elliptical weighs around 30 pounds. 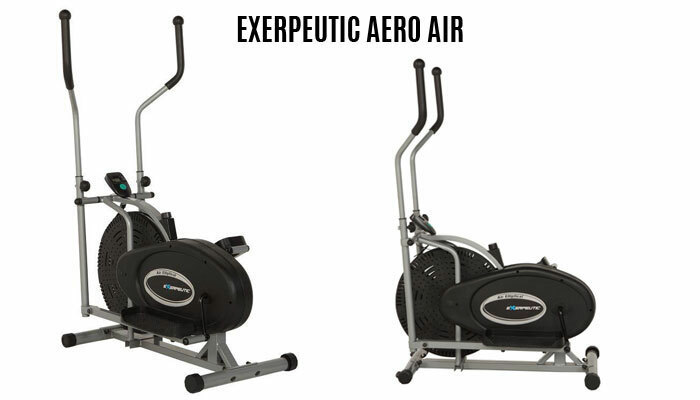 Exerpeutic Aero Air Elliptical is another cardio workout equipment which falls in this category. 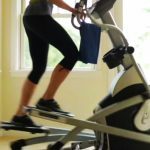 It is compactly designed and can handle up to 260 pounds of user weight providing a ‘zero impact’ exercise experience, without causing harm to hips, ankles or joints. It will burn calories while at the same time exercising your thighs, calves and overall leg muscles. 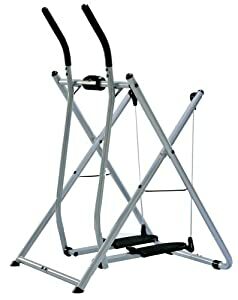 It uses padded dual action arms for strengthening the upper body to give a total body fitness workout. The Exerpeutic Aero Air Elliptical is specifically designed with a natural elliptical motion that eliminates any bouncy movements. You can stride forwards or in reverse to work different muscle groups. It has a variable dial tension control system allowing you to adjust the tension resistance for an easier or more difficult workout. Large pedals with a built-in ridge design will prevent any foot slippage when exercising. Transportation wheels are included for easily relocating the elliptical. Stabilizer and caps are also included that can level the elliptical exerciser on any floor surface. The computer monitor also comes with an easy to read large LCD display. The stride length is about 10 to 15 inches. The elliptical needs to be assembled and comes with instructions and tools included. It will take about 30 minutes to assemble this machine. This elliptical does not require power. It only requires small batteries for the display unit, which are included. The handlebars are 22 inches wide and extend 16 inches forward while moving. The machine weighs around 50 pounds. 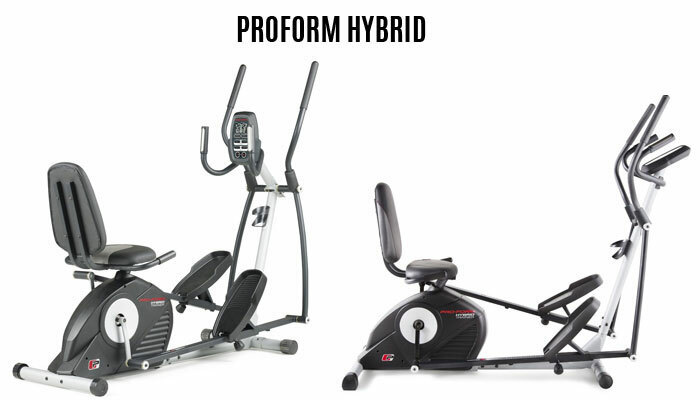 The ProForm Hybrid is a recumbent bike and an elliptical 2 in 1 trainer. 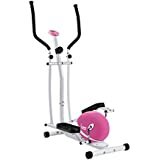 It is an ideal elliptical for home users that provides a comfortable lower and upper body workout. Use the recumbent bike to get a focused workout, which tones and strengthens while torching calories. The contoured ergonomic seat minimizes back stress while silent magnetic resistance makes it easier to challenge yourself and burn even more calories at every level. The center console features 14 motivating programs that help you mix it up maximizing results. However, it is not just a bike and in three simple steps, you convert it into an elliptical. The intense full body workout amps up your calorie burn while toning up your arms, legs and glutes. The unit needs initial assembling and most users were able to assemble it within two hours. It does not require power cords. Complete manual operation. The display panel runs on a small battery. Can be used to exercise both arms and legs in the standing position. The pedals are adjustable while the seat is not. 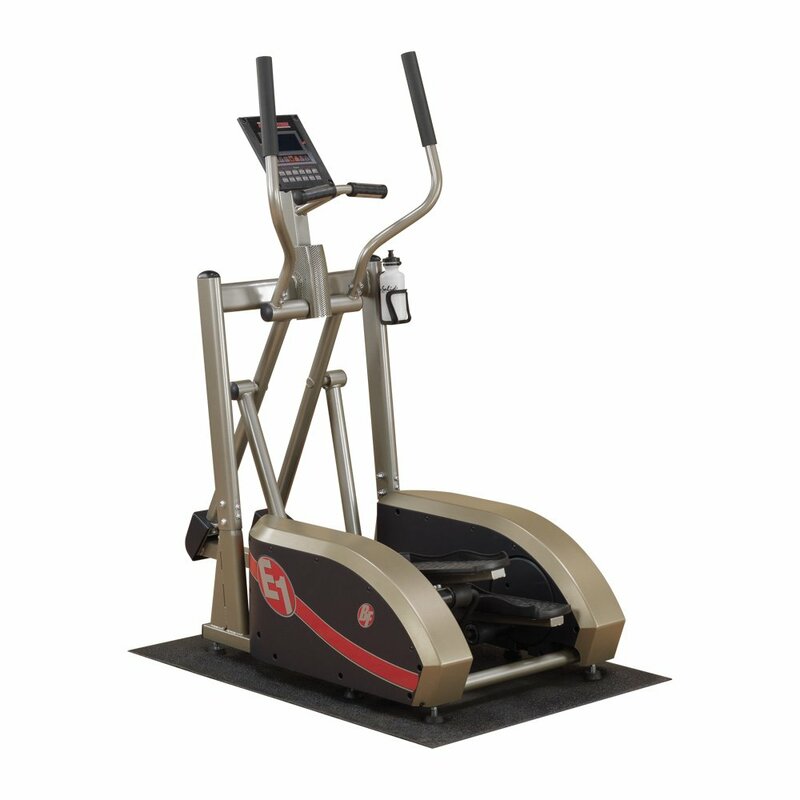 This compact elliptical has a stride length of 15 inches. Users had trouble in moving the elliptical from one room to another. The unit weighs around 138 pounds and is not foldable. The elliptical has a built-in heart rate monitor. The weight bearing capacity of this elliptical is 350 pounds. The arm poles are connected to the pedals and move whenever there is pedaling motion. The feet of the elliptical are rubberized and will not damage your carpet or floor. However, it is recommended to purchase a floor mat to place underneath. You can peddle in both forward and reverse motion. The unit does not have an iPad, phone or a water bottle holder. The arm workout can only be done in elliptical mode and not in bike mode. The sleek make of the Body Champ BRM3671 is designed with an emphasis on ergonomic and anatomical comfort. 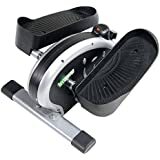 Especially the foam padded dual action adjustable handlebars and the oversized pedals for foot support, which allow any level of fitness to exercise in comfort. The additional handlebars also feature pulse sensors, so you can monitor your heart rate while keeping track of your calories burned on the LCD monitor. 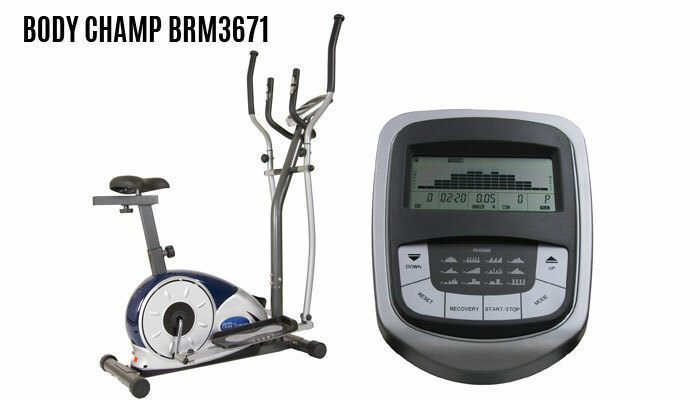 Body Champ BRM3671 comes with the ability to program 20 different workouts or you can use the included DVD as a guide. What separates this elliptical from others is the attached seat that is designed for ultimate comfort and adjusts vertically as well as horizontally. 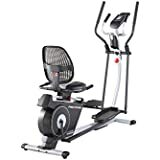 This means that just by sitting, you can turn the Body Champ cardio dual trainer into an exercise bike without any tools or adjustments, packing more workout in the same space or resting between upright workouts. 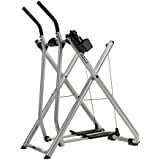 This elliptical does not fold but is extremely compact and does not take much room space. You can pedal in reverse but users have reported less resistance in reverse motion. Weight limit is 250 pounds with a 13-inch stride length. Body Champ BRM3671 needs to be plugged in to an electric power outlet to function. The unit weighs around 80 pounds. 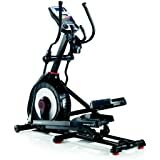 Schwinn A40 Elliptical Machine is designed to deliver a comfortable workout with maximum results. Simple to assemble and a unique display console. The A40 has eight resistance levels and 6 fitness metrics for feedback of your workout. It comes with an integrated heart rate monitor. The assembly may take 1 to 2 hours. Make sure to follow the instructions properly to avoid misalignment that may cause stability issues in the longer run. 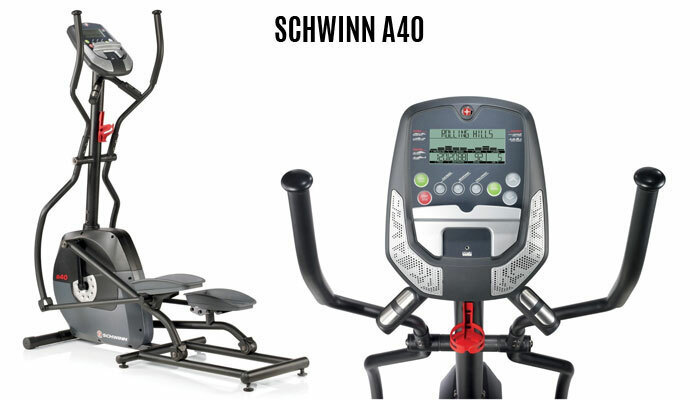 The Schwinn A40 has a stride length of 17.5 inches and does not have incline option. Weight limit for this elliptical is 275 pounds. The unit can be moved easily with wheels attached and it weighs around 100 pounds. This elliptical is not foldable. You can listen to music as it has built-in speakers and a wire is included to connect your device with the speakers. The display computer and resistance adjustment works on batteries or optionally you can also purchase an AC power adaptor. This elliptical allows reverse pedal movement. Schwinn 430 Elliptical is a heavy-duty machine packed with innovative features. This fitness equipment has a brand new dual track monitoring system. You can watch movies on your iPad, or read on your Kindle while charging the device and easily view results from 13 different workout metrics. The new monitors also provide motivation through every workout with 22 exercise programs and goal tracking to measure progress. As your fitness increases, you can choose from 22 levels of quiet and smooth resistance. The Schwinn 430 has large footplates to position your feet, a three speed fan to keep you cool during intense workouts and transport wheels for easy moving. Ergonomically placed heart rate sensors mean you can get a quick check to make sure you are in the optimum fat burning zone for the best results possible. Assembling this unit may take around 2 to 3 hours. 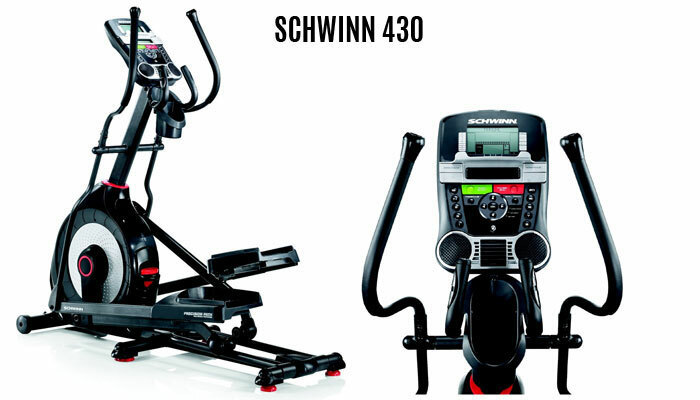 Schwinn 430 Elliptical comes with sealed acoustic chamber speakers to deliver improved quality sound. You can pedal in reverse but the program will reset if you are in the middle of your workout and this may alter your goals. There are two sets of arm handles – static and movable. The console unit has a USB port to connect your devices. 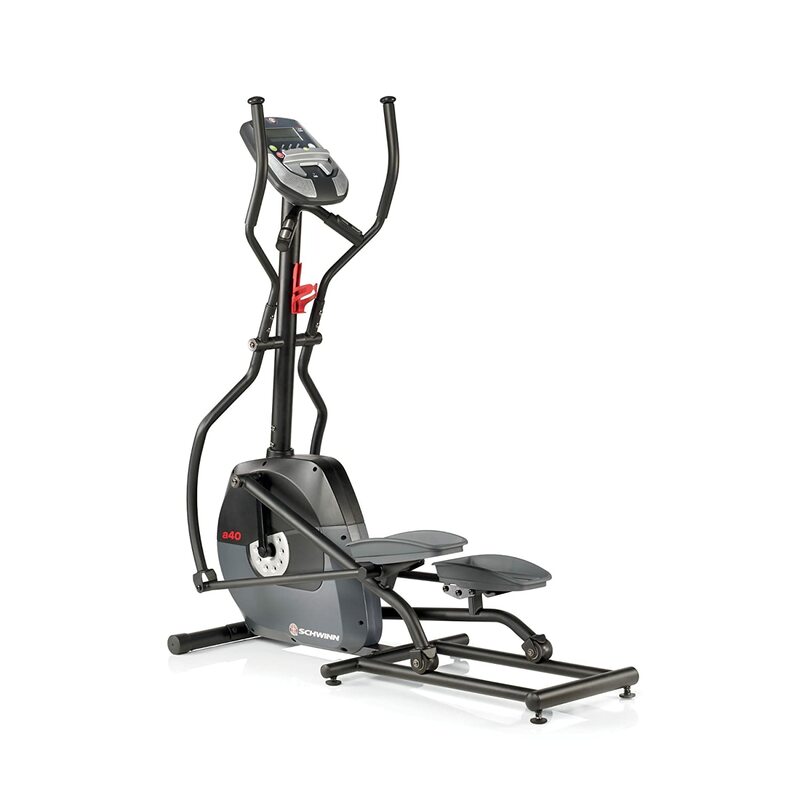 This elliptical has an adjustable incline of 10 degrees with six positions. The AC adaptor is included in the package. 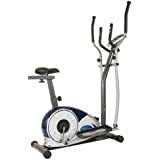 Schwinn 430 Elliptical has a stride length of 20 inches and a weight limit of 300 pounds. The unit weighs around 180 pounds. The machine is not foldable but has wheels in the front to move it around if needed. It has the capability to synchronize your workout results with MyFitnessPal app. 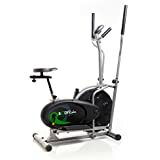 Nautilus E514c Elliptical Trainer has a smooth bio-mechanically accurate design and enhanced programming for better quality workouts. Eight profile courses to help keep you motivated for the results you want. Four Polar heart rate programs with telemetry are included. Polar is the premier brand of heart rate monitoring and fitness assessment. 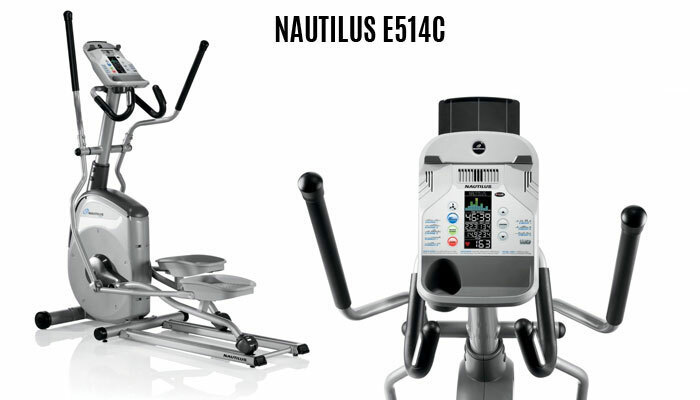 Nautilus E514c has an electronically controlled 16 levels of magnetic resistance system for smooth and efficient workout. The assembly may take 2 to 3 hours to unpack and assemble. It comes with easy to follow instructions. The unit has a blue backlit LCD display with easy to read console. The unit does not have an incline adjustment. Many users found the resistance to be quite strong and very hard to peddle. Nautilus E514c has two sets of handlebars – fixed and moving. The unit comes with an AC adaptor. It has built-in 2-speed fan and wheels located at front for transport. The unit weighs around 165 pounds. The stride length is fixed at 18 inches and max weight limit is 300 pounds. You can peddle in reverse with this elliptical. 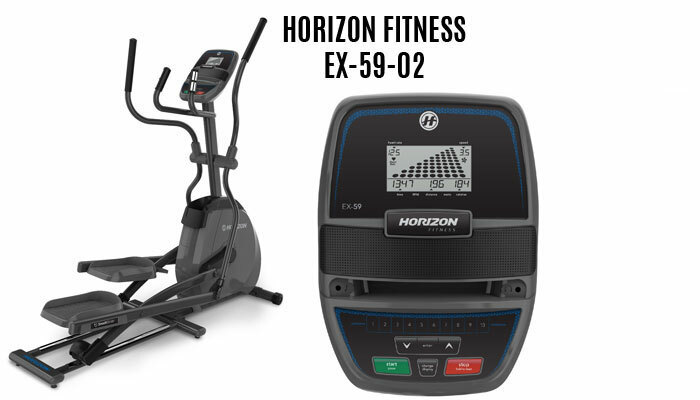 Horizon Fitness EX-59-02 is another top rated elliptical trainer in the home fitness arena. It features Horizon’s exclusive six star certified frame that provides ideal body alignment for a comfortable workout. The long 18-inch stride simulates a natural running or walking motion. Ten levels of electronic resistance allow you to start at any level and work your way up. You can easily adjust the intensity at any time using one-touch quick keys. The EX-59-02 offers plenty of motivating features to keep you going. Integrated sonic surround speakers allow you to connect to your iPod or any other mp3 device. Ten programming options add variety to your workouts. You can pedal backwards or forwards. Horizon Fitness EX-59-02 plugs into an AC electrical outlet. The power cord is supplied with the unit. This home elliptical does not have an adjustable incline. The stride length is 18 inches and is not adjustable. There is no built-in fan. The unit does not have wheels and it weighs around 140 pounds.